We are less than 3 weeks out from the 2019 GMAG, the schedule of events is published now and we hope you will take a look and plan to attend BOTH days of our event. I think the key word here is “our” event. This event is truly a result of your commitment to aviation shown through your willingness to be current members of the Minnesota Pilots Association. This year we have moved the venue to the Buffalo Municipal Airport (KCFE), a non-towered airport just west of the MSP Class B airspace. While we are excited about the move, we know that this will mean a little more of a drive for those living on the east side of the Twin Cities, but we think you will find it worth the drive! Flying in should be a breeze and we think that if we have the beautiful weather that we are due for this will set records for the number of pilots who fly in! A Fly In GMAG…what a beautiful thing! Stay tuned, please plan on joining together with fellow members and hey, bring along a friend! We are confident you will all find something that you will enjoy at the GMAG! This entry was posted in Assn and tagged RSC on 04/07/2019 by Randy Corfman. 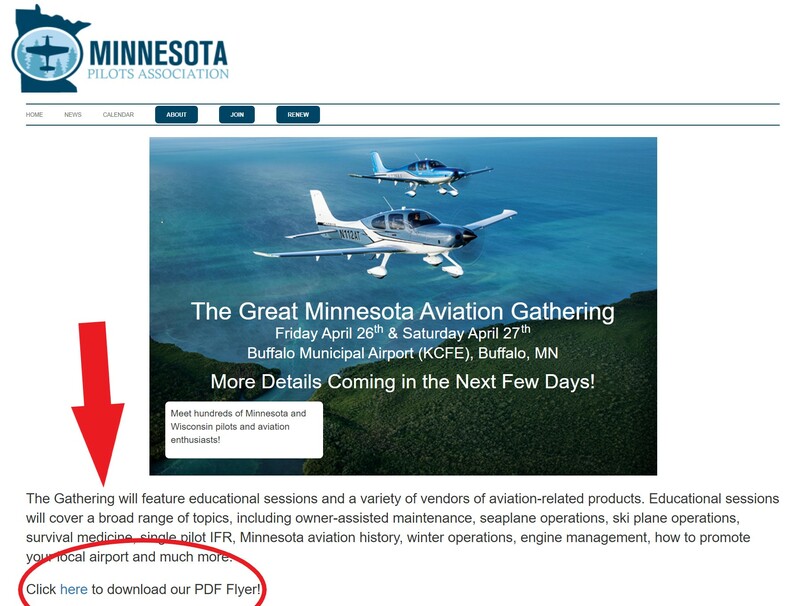 One of the things you can do to help promote YOUR Great MN Aviation Gathering is to click on the “GMAG” button at the top of the landing page and you will be taken to a place where you can click to download the 2019 GMAG Flyer that was created by Sarah Dickerson, our airline captain/graphic artist extraordinaire. Please print out a few of these and post in your local FBO, or any FBOs in your area, so that we effectively penetrate MN and surrounding states with this beautiful flyer! This will save us precious dollars in postage and you will be more effective than we have found many airport managers in getting these flyers in prominent positions! Thank you! This entry was posted in News and tagged RSC on 02/26/2019 by Randy Corfman. Congratulations to Gary Black, long time member of the MN Pilots Assn and fervent supporter of general aviation, for selection of a photo he submitted for consideration for use as the backdrop for the 2019 GMAG! Many thanks to all the great photos that were submitted! Selection of the photo is based upon not only the beauty of the photograph, but also the photo needs to lend itself for placement of text. We are also aware of the fact that Cirrus Aircraft Corporation has been a solid supporter of the MN Pilots Assn, and the GMAGs, from our very humble beginnings! Thanks, Gary, and congratulations! We will be providing a link for downloading the flyer on our website and Facebook page and ask that you please print it out and post at your local aviation hangout/hangar. We look forward to seeing you there! This entry was posted in Assn and tagged RSC on 02/25/2019 by Randy Corfman. 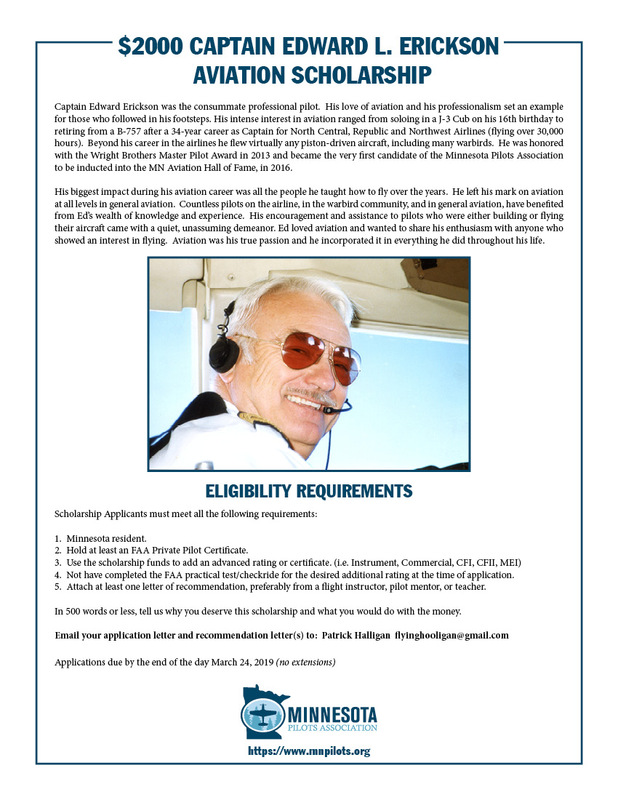 We are delighted to announce the inauguration of the Captain Edward L. Erickson Aviation Scholarship! Ed was our first nominee to the prestigious Minnesota Aviation Hall of Fame, and the scholarship will be awarded in his memory to a pilot who is pursuing advanced ratings and certifications on their way to becoming a professional pilot. We are thankful for the donations to the scholarship fund, and to members of the MN Pilots Assn, whose membership dues are being put to good use! Thank you! Please review the following flyer for details on the award. Application letters and Letters of Recommendation should be sent to Patrick Halligan at flyinghooligan@gmail.com. Deadline for submission is March 24, 2019. This entry was posted in Assn and tagged RSC on 02/20/2019 by Randy Corfman. 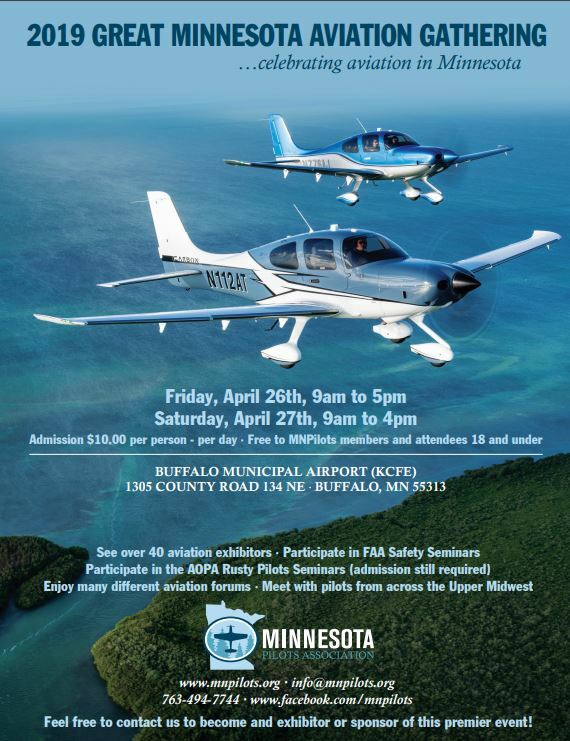 We are delighted to announce that the 2019 Great Minnesota Aviation Gathering will be held at the Buffalo Municipal airport (KCFE) on Friday and Saturday, April 26-27, 2019! Thanks to the generosity of Mike Wiskus and West Metro Aviation, and the pilots and hangar owners of the Buffalo airport, we will likely be able to have all the sessions, the exhibits and dining areas in nice, quiet warm hangars! We are excited to be rid of tents and the challenges/expense that they demand! As you may be aware, the Buffalo airport is just outside of the MSP Class B airspace, and will represent the first year we will be able to fly into a non-towered airport. We are thankful for the kindness and professionalism of the Anoka County-Blaine airport Tower folks for the great direction they gave us for the first 5 GMAGs, but we look forward to having more airplanes flying in for the events. We will be pleased to recognize those who receive the Master Pilots Award, given by the FAA. Please join us to honor our mentors and colleagues who greatly deserve the awards. While the awards are presented by our FAAST leaders, please know that the actual plaques are donated by non other than you, members of the MN Pilots Association. We are looking forward to presenting our very first Ed Erickson Aviation Scholarship to a deserving pilot who is planning a career in aviation. We are also happy to announce that Smokin’ Bonez BBQ food truck will be back this year, and for those of you who attended last year you may recall that the food was terrific! We will be incorporating the MN EAA Leadership Summit as a part of our Hangar Flying sessions, rather than in the evening, with the hopes that more EAA leaders will be able to fly in for each of the days. For those of you who will drive to the events, parking will be a breeze. The airport is really a short, beautiful drive from the western suburbs. An added bonus…please mark your calendars, and register, for the Minnesota Aviation Hall of Fame Banquet to be held immediately following the 2019 GMAG on Saturday evening, April 27. Please see their website for registration information. We think it will be a great weekend for aviation in Minnesota! Please mark those dates down on your calendar. We hope to see you there! This entry was posted in Assn and tagged RSC on 01/18/2019 by Randy Corfman. We have been made aware of the closure of KBFW, the Silver Bay MN Municipal Airport. 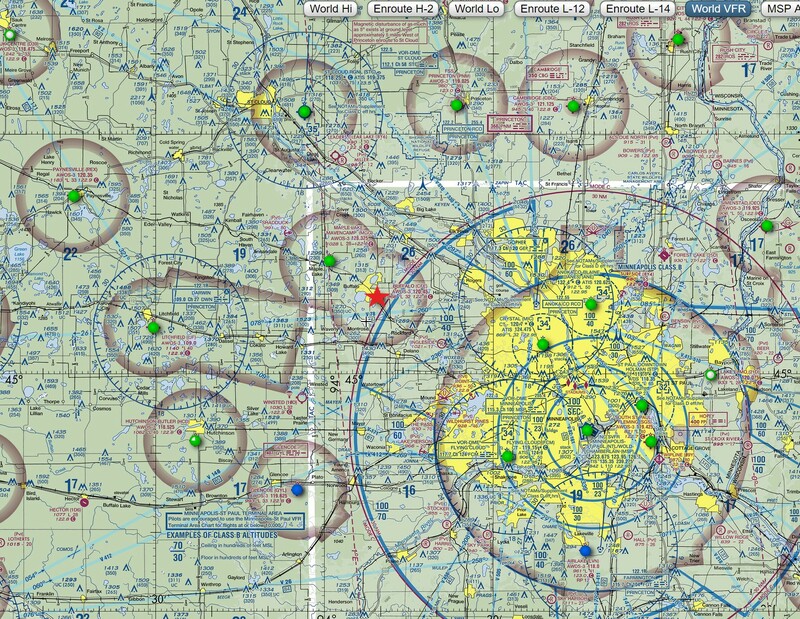 I have reached out to MN DOT Aeronautics to find out more about the action, but would appreciate learning anything you might have to share to provide insight into what is going on there. Please email me at info@mnpilots.org. We can’t afford to lose any airports in Minnesota, and any help you can offer will be appreciated. Thank you! This entry was posted in Assn and tagged RSC on 06/07/2018 by Randy Corfman. Here are some links that you may find useful…they are the most frequently requested! Thanks to Jay Flowers from the ND FAAST for this information! This entry was posted in Assn and tagged RSC on 06/05/2018 by Randy Corfman. Kurt Pennuto, our RAF State Laison, sent me this summary of the events at the Bowstring Airfield meeting last Wednesday. Apparently approximately 20 aircraft flew in. I think this helps demonstrate the influence we can have on issues such as this. Our challenge now is to keep on using these airfields, and not simply let the airport go unused. I flew up to Bowstring airport in northern Minnesota yesterday to support Kurt Pennuto in representing the RAF. It is really a beautiful airport in a great location. It’s in the heart of the Minnesota northwoods and lakes area that is truly a special place. Kurt did a great job identifying this strip as one with high recreational value and one that the RAF should be involved with. The Bowstring airport was rumored to be under threat of closure. Yesterday’s meeting included Itasca county commissioners, airport commissioners, Mn-DOT, and about 45 or so interested pilots and citizens. The meeting went very well. The county commissioner opened the meeting saying that they were really not considering closure but that there were issues that need to be addressed. The county’s biggest issued appeared to be related to their airport ownership and the perception that this ownership was exposing them to liability. At the root of the matter was that they had airport inspection from MN-DOT two years earlier wherein Mn-DOT noted 17 obstructions at the airport (trees) that needed to be removed. There was typical poor communication between the airport commission and the county commissioners. Upon belatedly learning of the non-conformance of the airport, the county (especially the county attorney) appeared to have gotten a bit agitated. The county commissioners were actually quite surprised by the turnout to the meeting. They specifically noted the RAF’s attendance and appreciated us being there. In the end, the meeting served to re-establish communications between the county and the airport commission along with MN-DOT. The perceived threat of closure is now gone and the airport even learned of additional funding that was available from MnDOT. It appears that the future of the airport is on an even better path. Many thanks to those of you who attended the meeting, or contacted the Commissioners. You made a difference! This entry was posted in Assn and tagged RSC on 05/04/2018 by Randy Corfman. We are only days away from the 5th Annual Great MN Aviation Gathering, folks and the weather forecast is looking TERRIFIC for the event this year (….it is about time!). Please click on the link at the top of the page and look for the schedule of events, and please plan to attend both days! We will be posting instructions for those who choose to fly in on the GMAG page. If you choose to fly in, please bring your own tiedowns! We hope you will fly in, as this is one of the great perks of our event…YOU CAN FLY IN AND TAXI RIGHT UP TO THE GOLDEN WINGS FLYING MUSEUM VENUE! We will be holding a silent auction for some very big items (Garmin equipment and Float Plane rating/resort lodging), as well as a big raffle, on Saturday noon. We will also be selling tee shirts with the 2018 GMAG Photo winner on the shirt! …and posters of the same! This entry was posted in Assn and tagged RSC on 04/22/2018 by Randy Corfman. We are less than 2 weeks away from the 2018 Great Minnesota Aviation Gathering! Please click on the 2018 GMAG at the top of this page and you will find the schedule of events. We are blessed again this year with a full house of excellent, knowledgeable speakers. We also are blessed to have over 45 exhibitors again this year. We have been sending notices out to our members spotlighting our Sponsors and are now doing so with our Exhibitors. The long term forecast predicts 60 degrees (I know, that seems unfathomable at this point in time) and we hope you will be able to drive or fly in! We hope to see you at YOUR Great Minnesota Aviation Gathering! This entry was posted in Assn and tagged RSC on 04/15/2018 by Randy Corfman.